UC Berkeley’s Energy and Resources Group and the Center for South Asia Studies are proud to present the 20th Annual Lecture on Energy and the Environment by Indian environmentalist, political activist, and recipient of the 2005 Stockholm World Water Prize, Sunita Narain. India is facing a double burden of environmental problems — of the poor and of the rich. So, on one hand, its forests are under threat but on the other hand, its rivers are increasingly polluted by sewage and industrial waste and cities are choked under toxins from the spit of its vehicles. All efforts seem pointless as the scale of the problem is enormous and palliative actions do not seem to work. So, what will work? Can India reinvent its way to growth without pollution? Are there lessons in this for the rest of the world? What can we learn from the environmentalism of the poor to face the challenge of climate change that is threatening the world as we know it. 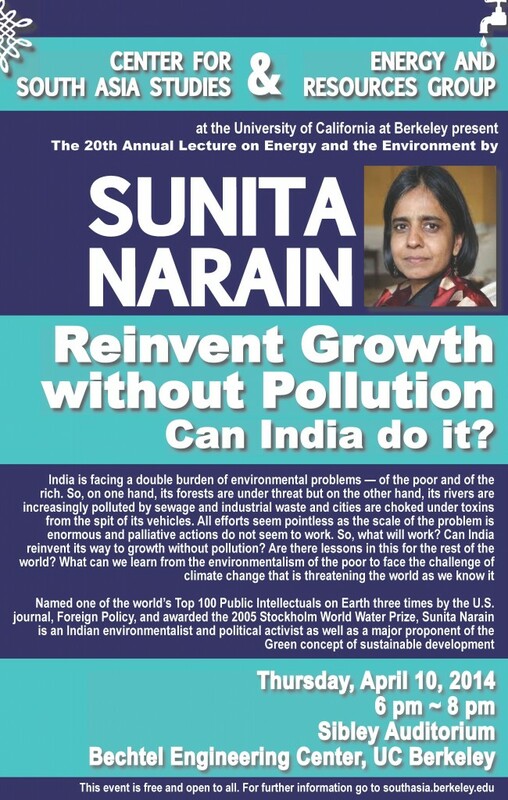 Named one of the world’s Top 100 Public Intellectuals on Earth three times by the U.S. journal, Foreign Policy, and awarded the 2005 Stockholm World Water Prize, Sunita Narain is an Indian environmentalist and political activist as well as a major proponent of the Green concept of sustainable development. Narain has been with the India-based Centre for Science and Environment since 1982. She is currently the director of the Centre and the director of the Society for Environmental Communications and publisher of the fortnightly magazine, Down To Earth. Narain started working with with CSE in 1982, and took over the organsiation and the magazine in 2001, after the death of Founder Editor Anil Aggarwal. Under CSE, Narain has worked in a various fields related to environment. Be it forest development, climate change, or water resources; she has researched, written about and worked on location for these issues. What however caught the attention of the entire world, was the claim of the CSE that cola giants like Pepsi and Coke use contaminated, pesticide-ridden water in the drinks that they make and distribute in India. While the CSE provided hard proof twice over for their findings, the companies denied it and the government refused to do anything, and instead launched an enquiry on CSE to check if their findings had any value. Apart from Green awards, Narain has been featured by Time magazine as one of India’s most influential people, and in 2005 and again in 2008 and 2009 she was included by Foreign Policy as one of the Top 100 public intellectuals on earth. In 2005 she was awarded the Padma Shri by the Indian government. In 2005, she received the Stockholm World Water Prize for work on rainwater harvesting and for its policy influence in building paradigms for community based water management. Environmentalists have a lot to complain about in India and Sunita Narain does her fair share. She can be acerbic and populist but there’s no doubting that she draws attention to issues that need it. The Delhi-based Centre for Science and Environment (CSE), which she heads, monitors air pollution levels around India, studies the effects of climate change and even runs training courses that show businesspeople and students how to lead greener lives. But it is her criticism of international soft drink makers Coca-Cola and PepsiCo that has won Narain most attention. Over the past few years the CSE has regularly alleged that soft drinks sold in India contain high level of pesticides — a charge both Coke and Pepsi reject. Narain says her main goal is not to hurt companies but to spur the government to tighten regulations. But a little publicity goes a long way: her pesticide charges spurred some Indian states to ban the sales of Coke and Pepsi last year. Now, she’s taking on river polluters. This talk is presented under the aegis of Urban WASH, the Center for South Asia Studies’ urban water initiative designed to address the urgent need of urban water and sanitation issues in South Asia.